Let’s assume that you want to configure an email configuration for an Android device. Look at the picture above. 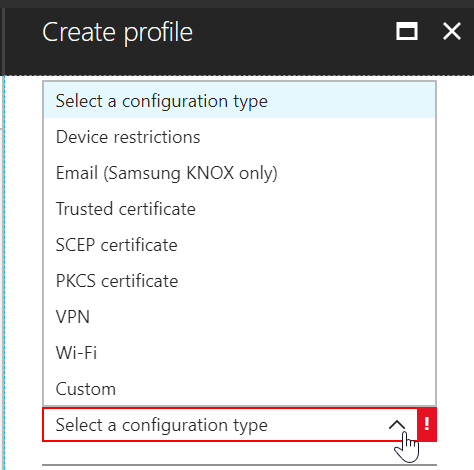 That is what you will see in Intune when trying to create an email configuration for a (regular) Android enrolled device. Notice something? Yes, email is not an option (unless you’re using KNOX)! You cannot push an MDM email payload to an Android device by default. What about an app configuration policy? Nope, you can’t do that either! 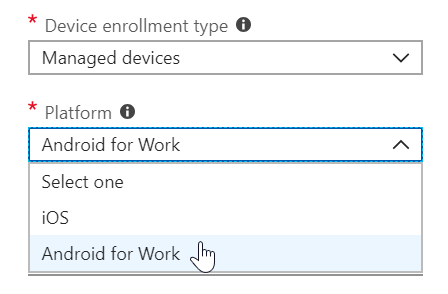 As you can see above, when you try to create an app configuration policy for enrolled devices, you only have two options: iOS or Android for Work. Regular Android is not supported. If you want users to be able to use email on their enrolled Android device, you must consider whether to have them enroll as an Android or Android for Work device. If they enroll as regular Android, they will have to configure their email application manually. The only way to auto-configure an Android device for on-premise Exchange email is to enroll the device using Android for Work (or Knox). Side note: if you are willing to bypass enrollment altogether, you may be able to use MAM policies to auto-configure Outlook.